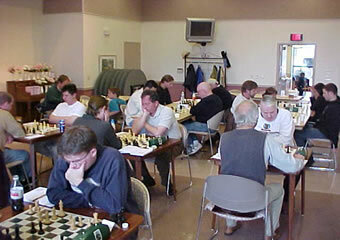 "The Paso Robles Winter Chess Open was held February 21, 2004 at the Paso Robles Senior Center. Twenty-Three participants entered the four round tournament to face off on this rainy Saturday. The tournament started at 10:00 a.m. sharp and did not finish until 7:30 p.m.
A total of five students participated in this highly competitive chess event. The United States Chess Federation ratings were as high 2108. This did not deter the students from playing in the event. “I don’t care if I win. I want to learn!” said Conor Moorman a fifth grade student from San Benito Elementary. Students in action at the Paso Robles Winter Chess Open. It was a student from Templeton high school who won the entire event with a tie break. “The Kelly’s played as a family and had a great time!” said tournament director Dennis Steele. Both Maria and her husband Shaun and their two boys played in the tournament. “They had a great time and they like the chance to compete against adult chess players.” said Shaun Kelly. Kelly Family competes in Winter Chess Open.